With Presidents’ Day week wrapping up, a Port Matilda Elementary School third-grade class did something that put students in the shoes of past presidents – they held the Presidential Wax Museum that allowed students to research a president, and then dress up like that president and hold a short presentation. Open to families and community members, students lined the hallways without moving. Their presidential characters were activated when someone tapped their hand leading them to spout off information about the president they represented. “We learn a lot and it’s fun,” said student James Cowan who portrayed Ronald Reagan. 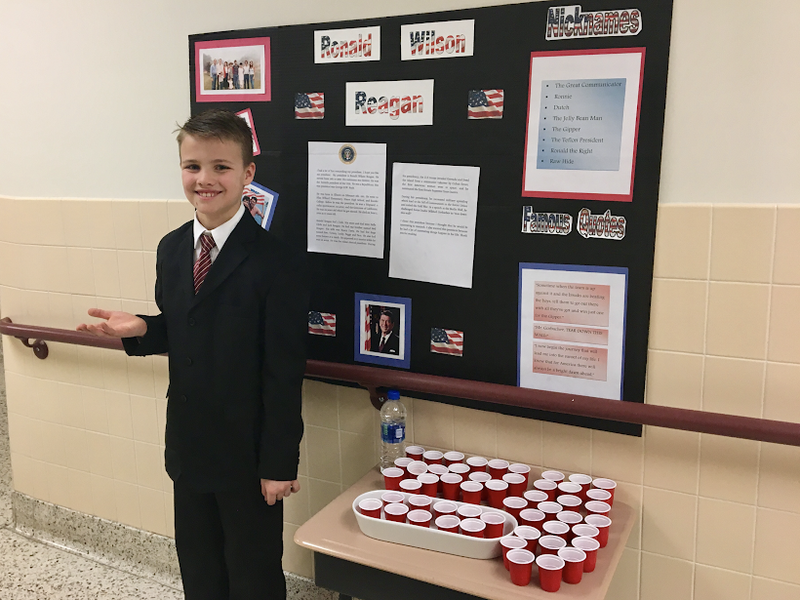 The third-grader even had props at his station – jelly beans available to guests, because he said they were Reagan’s favorite candy. Classmate Rylee Pluebell, who portrayed Franklin D. Roosevelt, even sat in a wheelchair. The Presidential Wax Museum was started about 12 years go with former third-grade teacher Carrie Sharkey who retired last year. It’s now been taken over by current third-grade teacher Sarah Stere. Sharkey, however, still comes back to volunteer.